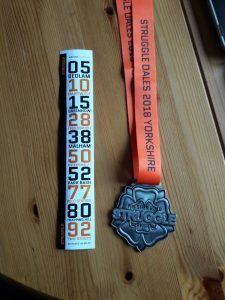 ‘Struggle Dales’ is 108miles with over 10’500ft of climbing, add in the heat (mid 20s) and the wind (a gusty 30+ south easterly) and it’s name ‘Struggle’ was certainly warranted. fl ag was a sufficient warning. At 92 miles in and feeling pretty broken you return to Pateley Bridge for the final major test, Two Stoops (also known as Nought Bank). Another 1.5miler breaking 20% at times was beyond me… After much pain, suffering, and (ashamedly) a little walking I reached the final summit. A stunning descent off the moorland returns you to Nidderdale and an undulating 10mile spin takes you back to the event base. The route, the people, the food / drink stations, and the beer & burger tent at the finish were all superb; as is the bling. One to return to…who else fancies it next year?